Your smartphone is fine for selfies, but it can't take them with a $1,000 Zeiss lens like Fujifilm's latest interchangeable lens camera. 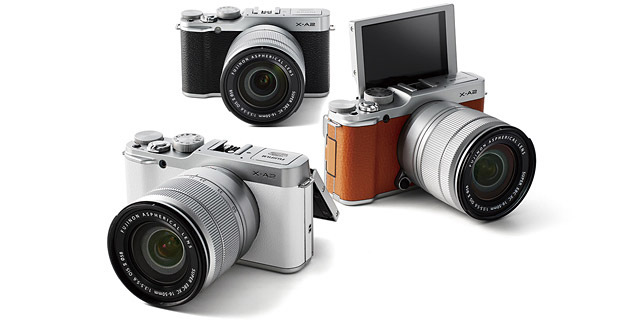 The X-A2 is a successor to its bottom-rung X-A1 model, but Fujifilm has changed the marketing thrust to selfies by adding a 175 degree flip screen for easier self-framing. It also carries face and eye detection features that are activated automatically when the 920k dot screen is flipped around. Otherwise, the 16.3-megapixel, APS-C sensor-equipped camera is little changed from before and will arrive next month in black, brown and white for $550 with a 16-50 f/3.5-5.6 lens (24-75mm 50mm equivalent). You can also grab it for $699 with a 50-230mm lens if you'd rather point it in the other direction.